Add a decorative finish to your cupboards with Krylon®! Remove glass panels, wrap in newspaper and set aside. Remove any and all hardware and put in a container and set aside. If the cupboard surfaces have a thick build up of old paint, use a paint remover. Otherwise, simply sand. Protect the work surface with newspaper and be sure to wear protective gloves and eye wear while sanding. Apply paint remover to the cupboard following package instructions to remove layers of paint - multiple applications and removals may be needed. Clean all surfaces with mineral spirits to remove the stripper and last bits of paint. Sand the cupboard with a coarse/180 grit sandpaper with a sanding block or palm sander. Fill any cracks, dents or dings with wood putty following package instructions. Sand again with a fine/220 grit sandpaper. Remove all dust particles with a vacuum followed by a tack cloth. Paint all surfaces with Krylon® COLORmaxx™ White Primer. With newspaper and tape cover the outer area of the cupboard. Paint the inside following instructions on the can with Krylon® COLORmaxx™ in Satin Iris. Let dry then remove the masking. 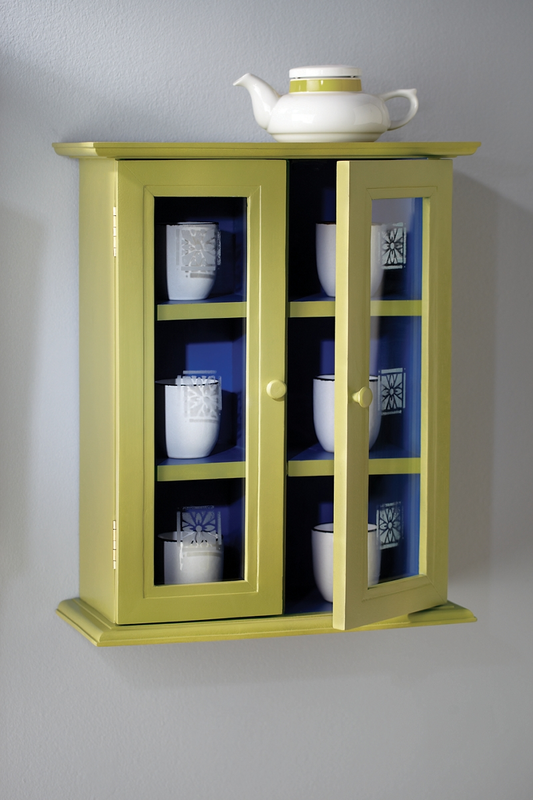 Mask the interior of the cupboard and paint the outer portion and doors with Krylon® COLORmaxx™ in Satin Avocado. Clean the glass for the doors, adhere the stencil with masking tape (or following manufacturer instructions) and tape off any areas that are not to be frosted. Spray frost Krylon® Krylon® Frosted Glass Finish onto glass with a light coat. Let dry several minutes and then remove the stencil. Reassemble the cupboard with new hardware and reinsert the glass.